One may sometimes hear that US manufacturing is a vestige of a bygone era. That American companies can’t compete with the cost of foreign labor and cheaper raw materials, resulting in an off shoring of jobs to countries like India and China. For many years, this was the overall trend in manufacturing. An estimated 5 million US manufacturing jobs were sent overseas between 2001 and 2011, with a third of them going to China alone, according to the Kellogg School of Management at Northwestern University. Looking back even further, Forbes estimates that the number of American factory workers fell from approximately 30% of the total population in 1950 to approximately 8.5% in 2017. This trend has plagued every manufacturing industry, from automobiles to telecom to clothing manufacturers, but many experts are starting to see a change on the horizon. For example, the Kellogg School explains that labor costs are beginning to rise globally, thanks in part to a burgeoning middle class in countries like China and India. For example, wages have nearly doubled in China since 2008, and an estimated 17% of manufacturing executives reported that they are starting to bring manufacturing operations back to the United States, according to the Kellogg School. Still, there are pros and cons associated with both domestic and international manufacturing. So what are some distinguishing factors between the two? US clothing manufacturers tend to adhere to stricter labor and environmental standards, which can increase production and manufacturing costs. While these guidelines can be an asset for the overall identity and quality of your brand, they can make sourcing with a domestic manufacturer more expensive than producing in countries without these human and environmental regulations. This then becomes a moral dilemma for each company to make. However, domestic manufacturers tend to offer quicker response and turnaround times, which can be an asset when bringing goods to market and when a specific deadline needs to be met. Local manufacturers might also offer greater flexibility when it comes to last-minute changes, and the stricter labor and intellectual property laws can yield higher quality products while protecting proprietary designs. Overseas production can generally produce products at a lower unit costs, but may require a higher minimum order. However, unit costs are only one part of the overall production cost and there are additional costs to keep in mind. First, given the location, there will be additional shipping costs associated with the transportation of materials and resources needed. This can increase the overall price tag and slow down everything from sample review to final production. Second, international manufacturers might require some additional administrative overhead and correspondence since the supplier and manufacturer aren’t local. Third, the cost of transporting the goods across the globe, as well as high tariffs, might negate some of the cost savings associated with lower wages. As well, overseas manufacturers do not typically give you your patterns or sourcing mill information. What this means is if you’re ever in a position where you need to move manufacturers, you have to start all over with development. Instead, if you start in US and build a foundation here, you can always scale out and move to another country later with your assets in hand. It can be challenging to weigh all of the factors associated with clothing manufacturing. On one hand, initial cost savings could result in increased shipping costs at the end of production. On the other hand, the extra manufacturing savings could free up money for further research and development. In the absence of a clear cost-benefit analysis, a best practice is to find reputable clothing manufacturers, either through word of mouth or through a vendor, and pick one that clearly outlines costs, timelines, and deliverables that are favorable to you and your emerging product. US clothing manufacturer Indie Source offers a highly personalized full-service approach to clothing manufacturing. They prioritize determining a clear budget with fashion entrepreneurs and keeping target manufacturing costs in mind throughout the process. Indie Source also draws on their network of more than 50 mills, importers, and converters to acquire approved materials in bulk for volume manufacturing. Indie Source is a full service apparel manufacturer and fashion consultancy for new and established brands. 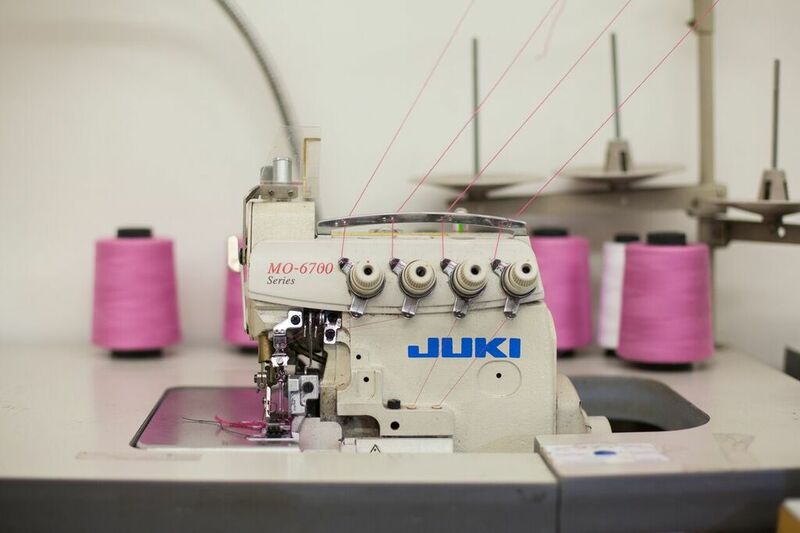 Based in Los Angeles’ fashion district, Indie Source is changing the way apparel comes to market by offering in-house experts across the development, production, digital design, and consultation phases. The innovative company is among the top clothing manufacturers in the USA and can help bring your vision to life with professional support throughout design, manufacturing, and marketing.